Etienne Brunet, soprano and alto saxophone; Fred Van Hove, church organ. 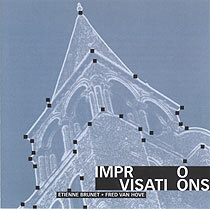 Tracks 1 and 2 were recorded in the church of St Germain-des-Prés, Paris on 2 June 1997; track 3 was recorded in the church of St Pierre-St Paul, Montreuil on 19 November 2000. Graphic design (front cover reproduced above) by Phong Luong Dien.